When I was a little kid I became fast friends with a girl who had just moved to the U.S. from Japan. As our friendship flourished, so too did the friendship between our mothers and soon enough her mom was asking mine to teach her how to make “American” food, in an effort to help her daughter fit in at school. What ensued was an ad-hoc cultural exchange of sorts, her mom taught my mom traditional Japanese cooking and my mom taught her how to make food eaten in the United States. I started bringing rice wrapped in seaweed for my school lunches (with little smiley faces made out of vegetables on them) and she started bringing grilled cheese sandwiches (with the crusts cut off). This early friendship probably had more of an impact on my palate than I can easily quantify but one thing I do know is that it instilled in me a life-long love of mochi. Time intensive when made from scratch, mochi is a Japanese rice cake made out of glutinous rice that is pounded into a paste and then molded. Luckily you can buy mochi already prepared in most Asian markets (and a lot of health food stores). As a kid, I used to pop a pre-cut mochi square into the toaster oven and gobble it down as a snack. I no longer own a toaster oven, it would take up the square foot of workable counter space I have. Luckily I am now old enough to use the stove, and mochi cooks well in a grill pan. When grilled, mochi gets puffy–crispy on the outside and super gooey on the inside. It provides the perfect counterbalance for the fennel and blood orange as well as my favorite ingredient in this dish–wasabi sesame seeds. The wasabi sesame seeds are actually much easier to find than they sound, they are marketed as rice seasoning and sold along all other kinds of flavored sesame seed toppings in most Asian markets. They add nice texture and a kick for a very low price, my jar just cost me $3.00. For the Fennel: Combine the fennel, miso, juice, ginger and sesame oil in a bowl and let stand for 10 minutes. Add the fennel mixture to a small skillet and cook over medium-high heat until most of the liquid has evaporated, approximately five minutes. Set aside. For the Mochi: Add the mochi to a hot grill pan and cook until both sides have grill marks and the mochi has puffed up. Approximately 3-4 minutes each side. 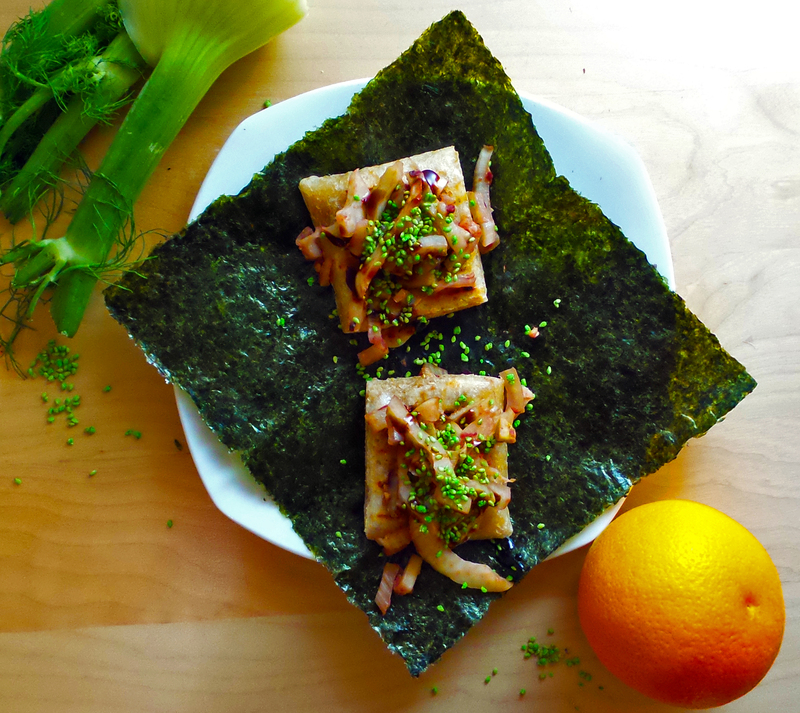 To Serve: Toast a piece of nori by holding it in tongs over your stove burner for a couple of minutes. Place the mochi on top of the nori. Arrange as much of the fennel as you like on top of the mochi, drizzle with the balsamic vinegar and garnish with the wasabi sesame seeds. Makes 1 serving. This entry was posted in Mains and tagged blood orange, fennel, gluten-free, mochi, soy-free, vegan, vegetarian, wasabi. Bookmark the permalink.